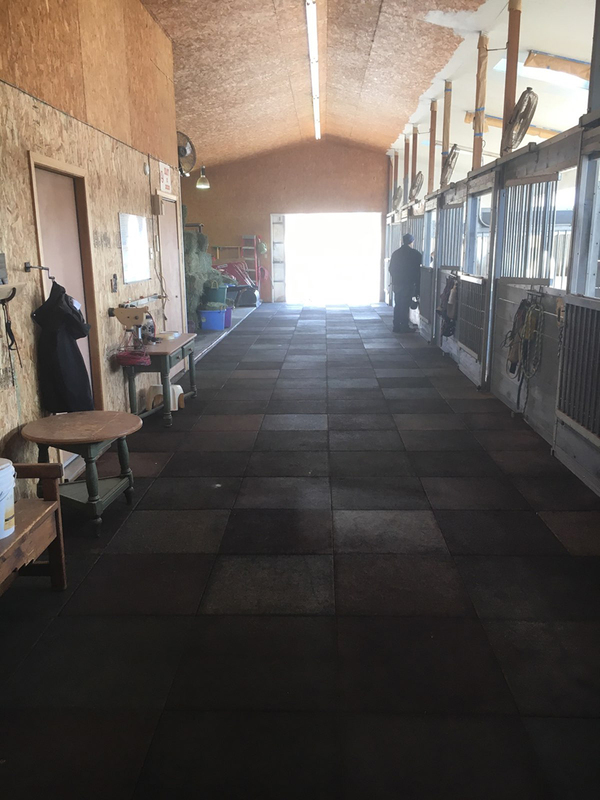 Description - Horse Stall Tiles offer a long lasting rubber floor covering system for use in horse stalls, wash bays, breeze ways, and walk ways around barns or stables. These 1" thick recycled rubber tiles are available in a flat top or brick top pattern and are easy to install. Horse stall tiles also offer a slip resistant and shock absorbing surface to help protect foals. These tiles are water permeable to allow for fast drying and include a 5 year manufacturer's limited warranty. Material – Each tile is made from recycled rubber from California recycled tires to provide a green flooring solution. Thickness – Available in 1.00" thick tiles. Weight – Each tile weighs 17.75 Lbs and each ramp accessory piece weights 4.8 Lbs. 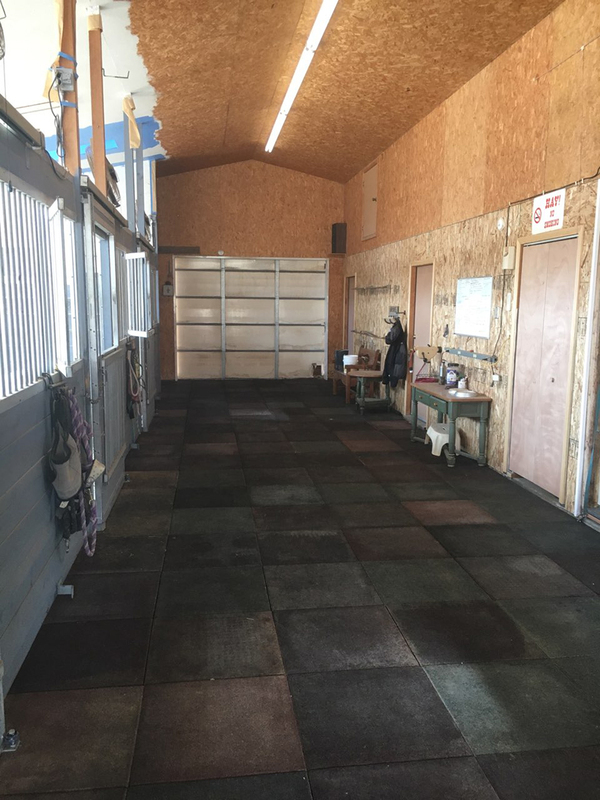 Recommended Uses – Rubber horse stall tiles have been used successfully as an equine flooring for use in barns, stables, as outdoor walkways, and in wash bays. Horse stall tiles are also an excellent flooring option to use with a variety of other hoofed animals such as pigs, cows, Oxen, and more. Sweeping the surface of the tile with a stiff outdoor bristle broom when necessary. Spraying or hosing off the rubber tiles with clean water as needed. Vacuuming the surface of the stall flooring with a shop vac if needed. Note: If the tiles do become stained in anyway, use a mild soap and water solution and gently scrub the tiles with a soft nylon bristle brush or mop. 1" thick horse stall tiles are typically installed by adhering the tiles to a substrate such as a concrete pad, wood, asphalt, or compacted gravel. A polyurethane adhesive is normally recommended since they often can handle freezing and thawing and are moisture cured. 1" thick rubber stall tiles can also be adhered down using a polyurethane adhesive however they also offer the option of using a dowel system to attach adjacent tiles. For more in depth horse stall tile install instructions, please Click Here. Ships from west coast facility. Provides a safe anti-slip and shock absorbing floor surface. Long lasting 5 year warranty. Our 1" Horse Stall Tiles are water permeable meaning they are porous and will allow liquids to flow through the tiles. What is the best surface to put under rubber tiles. 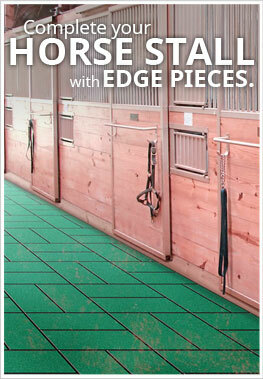 You can install our 1" Horse Stall Tiles over any hard, flat surface. We recommend installing our rubber flooring over concrete, asphalt, or plywood. Could a skid steer be used on this without damaging it? If so is there any rubber flooring that would hold up to a skid steer? You could use a Skid Steer on our 1" Horse Stall Tiles. As long as the bucket was not used on the tiles, you could drive back and forth on these tiles with this machinery as much as you like. We do offer a wide range of hard plastic tiles too that would be good for driving over them with a Skid Steer Loader as well. You can find those products on our garage floor tiles page. This was a reinstall after a water pipe broke in the stable. Unfortunately we don't have any before pictures that we could share.